When considering tolerance analysis most people envision a process by which the values of each of the dimensions involved in the analysis, or stack up, are simply summed to determine the extreme possible conditions of the distance being evaluated. This simple, initial treatment of the situation often uses arbitrary tolerance values applied to each of the part dimensions and assesses the “worst-case” scenario without regard to the actual possibility of ever achieving such extreme conditions. Put simply, it seldom reflects reality. However, such activity becomes the starting point for truly understanding what will happen to our designs if we continue to pursue understanding the real-world impact of variation on our designs. The first hurdle we encounter is the fact that oftentimes our assemblies don’t behave in the simplistic ways required to keep the mathematics of the predictive model within the realm of simple addition. Not only do translational variations acting indirectly to the direction of analysis require use of trigonometric functions, but oftentimes some of the most significant contributors are the rotational errors of the critical features within their tolerance zones. Such effects make development of the predictive model by hand extremely difficult, but fortunately there are tools on the market, such as CETOL 6σ by Sigmetrix, that relieve the engineer from the burden of the complex mathematics. Such tools enable one to develop a thorough, oftentimes complex model describing the behavior of the assembly as part-level features vary – a model that will form the basis of the various insights possible into the product being designed and produced. Understanding the sensitivities presented by the model enables the engineer to make changes in any of the above items to improve the design without having to change tolerances on features – an activity that typically increases part costs. 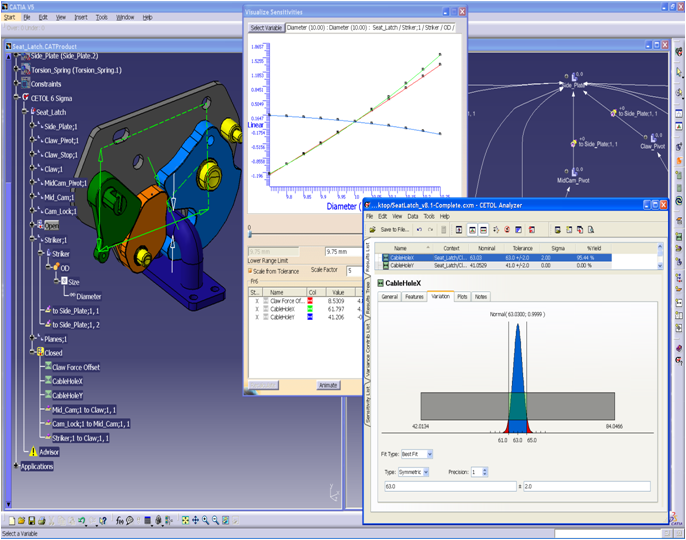 The tolerance analysis model defined within CETOL 6σ also allows one to understand the probability of achieving the desired assembly-level objectives. As stated previously the likelihood of all dimensions influencing the distance or angle of interest all simultaneously being at the extreme limit is very small. As long as one uses generally producible tolerances based on previous designs, experience, or input from manufacturing, the statistical analysis will be a better predictor of what will actually happen within the assemblies being produced than the worst-case treatment. 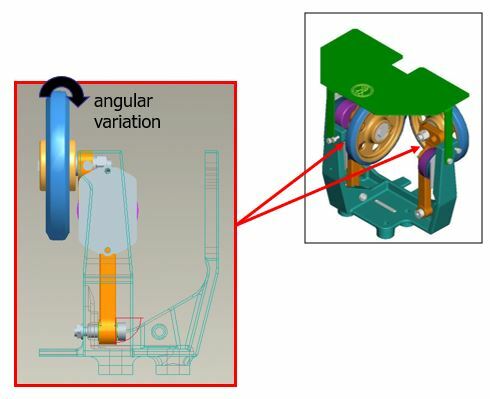 Such statistical assumptions enable the engineer to use larger tolerances on individual features, perhaps allowing the parts to be moved to less-expensive manufacturing process while still achieving the design objectives. Such analysis models don’t only benefit the design engineer. CETOL 6σ also shows what dimensions are the top contributors to the variation in the assembly-level requirements. This information becomes invaluable to inspection as it provides guidance for what data should be collected. Members of the design and manufacturing teams can often use their experience to presume what may be important, but the analysis model oftentimes identifies contributors that are not apparent. Without it companies can waste significant money collecting data on things that have no bearing on the product performance or miss things that are very significant. The analysis model provides insight into what should, or shouldn’t, be monitored during production. Another common scenario that often arises during production is what to do with an atypical set of parts. Whatever the cause the question remains the same – can the parts be used, or must they be scrapped, assuming of course that rework isn’t possible? In such cases the measurements of the parts can be entered into CETOL 6σ to understand the risks of using the parts as-is. The model, along with the data from production, is invaluable for providing decision makers with quantitative assessments of the impact of using the parts. With it people are just speculating on the proper course of action. One last situation in which having a tolerance model can help with business decisions during production is with assessing different vendors for a particular product. If the vendors provide different prices with accompanying different quality levels, the CETOL 6σ model can help evaluate the cost of using lower-quality products vs. the lower costs of such products. In some cases, there is enough design margin to choose the cheaper vendor products, and in other cases it may actually be less expensive overall to pay more for a particular part, but again without a model for evaluation such decisions are often guesswork. As you can see the time invested in defining often complex tolerance models with tools such as CETOL 6σ can reap benefits not only during the design phase but also during many situations in production. These examples show how having real-world data along with a model into which the data can be entered has enabled companies from all industries to make better decisions that help improve the bottom line.